Primitive Hut is a temporary installation that challenges architecture's stasis and permanence. The piece will transform between states of solid, frame, and void, while, through its decomposition, it will assist the growth of trees, which will replace the physical geometric form with a comparable, but radically different and now living, form. Primitive Hut recalls Laugier's 1755 etching of the Primitive Hut which blurred the lines between nature and architecture. 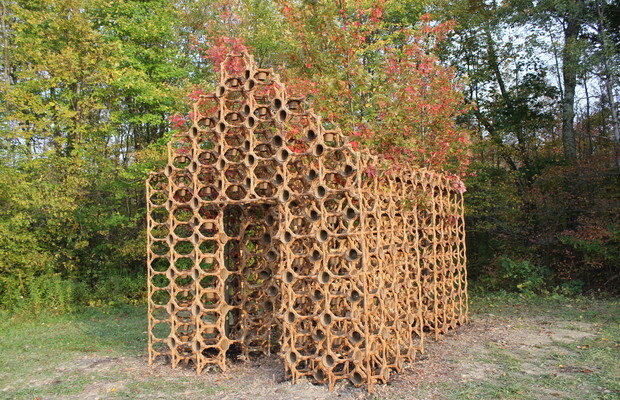 The implied house form is built around four saplings from a lattice of hemp and biodegradable resin, and in-filled with manure cylinders (an off the shelf decomposing plant container product called "Cowpots"). Eventually, as the structure decays, only the trees will remain. O'Donnell was born in Athlone, Ireland, and raised there and in Derry, Northern Ireland. She received her B.Arch. from the Manchester School of Architecture, England; and her M.Arch. from Princeton University. Before teaching at Cornell, O'Donnell taught at the Irwin S. Chanin School of Architecture at The Cooper Union and worked at KCAP Architects and Planners in Rotterdam, Netherlands, and at Eisenman Architects in New York City, where she was the project leader for several projects including the Hamburg Library and the Pompei Santuario Railway Station. Miller was born in San Paul, Minnesota, currently lives in both Beijing and New York. Miller is the creative design director and founding partner at AntiStatics Architecture. He is also a visiting professor at Cornell University. He received his BFA in Sculpture from the University of Colorado with a minor in Mathematics, and a Masters of Architecture from the University of Pennsylvania. Before founding AntiStatics with Mo Zheng, Miller was the lead designer and project manager for Jenny Sabin Studio.